One of the fascinating aspects from the pages of the Church of Ireland Gazette (formerly Ecclesiastical Gazette up until 1900 and the Church’s weekly newspaper since 1856) are the lesser known stories that can be found when researching. Unearthing how Laragh Tin Church, in the diocese of Clogher and county of Monaghan, came to be constructed at the end of the 19th century is one such example. Telling the full story behind this little news piece, illustrated with extracts from the newspaper and complementary sources, historian and Church of Ireland Historical Society committee member, Dr Miriam Moffitt recovers the full story of Laragh church – a delightful chapel-of-ease in the parish of Crossduff and located midway between the towns of Carrickmacross and Ballybay. The story begins with a fund-raising effort to build the church, which was kick-started through the newspaper. The death of his eldest son Henry, a 14-year-old pupil at Harborne School in Birmingham, may have prompted James McKean to seek to erect a church adjacent to his residence and close to his milling industry at Laragh. On 21st March 1890, less than 12 months after the boy’s death, the Revd Thomas Joseph Charlton, rector of Crossduff (1884-1903), placed a notice in the Irish Ecclesiastical Gazette (forerunner of the Church of Ireland Gazette) in which he appealed for funds to erect a church at Laragh. This advertisement outlined a need for a permanent place of worship and alerted readers to the presence of eight Church of Ireland children in the area. 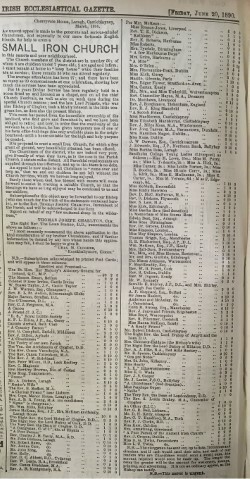 The Gazette would republish Mr Charlton’s appeal during the spring and summer of 1890 and as the months went by, further notices would appear including the names of donors and amounts contributed, with the most complete list published on 13th June 1890. The building, dedicated to St Peter, was consecrated by the Rt Revd Charles Stack (Bishop of Clogher 1886-1902) in August 1891. Its tower was topped with a weather-vane surmounted by a cockerel (signifying repentance); its pulpit sat atop a chunk of uncarved rock (petris), while an image of the saint holding the keys to heaven occupied a prominent place in the stained glass of the east window. The full-page account of its consecration published in the Gazette of 21st August 1891 also described the church interior in detail. The building reflects two important movements of the late 19th century: the Arts and Crafts movement and the movement to identify the contemporary Church of Ireland with the early Irish Church. Tin churches (also known as ‘tin tabernacles’ or ‘iron churches’) were an inexpensive way to provide rapid-build accommodation and were often replaced by more permanent structures as funds permitted. They were commonly used in the late 19th century, delivered as factory-produced kits to be erected and finished on-site and were regularly advertised in the Irish Ecclesiastical Gazette. 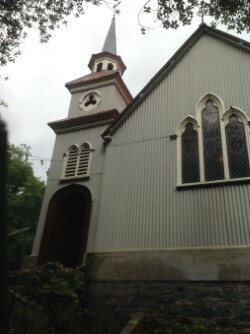 The only tin church currently used by the Church of Ireland is situated at Lurganboy in County Leitrim (diocese of Kilmore), while two Roman Catholic tin churches are still operative at Sallins in County Kildare and Rearcross in County Tipperary. Although de-consecrated since 1962, Laragh Cchurch remains an architectural gem sited in a delightful wooded setting beside a river. By contrast to the norm, however, Laragh church, was elaborately decorated and built to last. Its windows were filled with cathedral glass with ruby-coloured borders; the chancel floor was covered in mosaic tiles; the pews in the nave were pitch pine; the choir seats were oak, their tops adorned with fleurs de lis; the oak communion table was an ornately-carved construction and the ‘exceedingly handsome’ oak altar-rail was finished with clusters of brass and bronze pilasters.